Happy New Year from Sailing Fortuitous. 2014 kicked off with a decent snow storm and stupidly low temperatures across the northeast, so I took a drive down to the shore to check on the boat and make sure that nothing weird happened with the cover. The marshes that I pass on the way to the marina were frozen. This isn’t full-strength salt water, but it’s definitely brackish, so it’s been cold. Fortuitous was fine. The cover looked good, and there was almost no snow piled up. There wasn’t even that much snow on the ground. I thought that the shore got more snow than this, but if it was as light and powdery as it was at the homestead, it’s possible that it mostly blew away. It’s clearly been windy, since this icicle is far from vertical. …because the slips were definitely full of ice. The ice in the crab boat paddock was interesting—it looked like it had become cracked at some point, then liquid water squeezed up between the cracks and froze. I guess the owners of that Capri 22 are leaving it at the gas dock (with the sails on) all season. In areas where the snow drifted (or didn’t blow away), it took on the look of a high-desert mesa, with odd cliffs and strata. We’ve seen this before, back in 2010, but it’s always fascinating. It would be more fascinating, perhaps, if it were 82° and we could go sailing, but this is New Jersey in January, and I’m not yet so far into the winter doldrums that I’m petitioning for miracles. 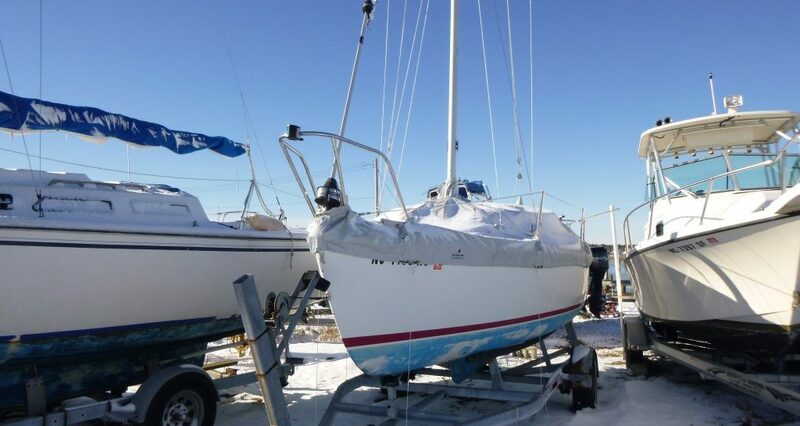 I’ve got a couple projects that I’m hoping to finish up before the start of the next sailing season, and would be happy to get this snow stuff out of the way now in exchange for an early spring.